I am so excited to tell you all about a new contest. I almost didn't say a word because I want to win the prize but then I thought better of that and decided I just had to share! You know Karma and all. LATAM Airlines Group is hosting an amazing contest! 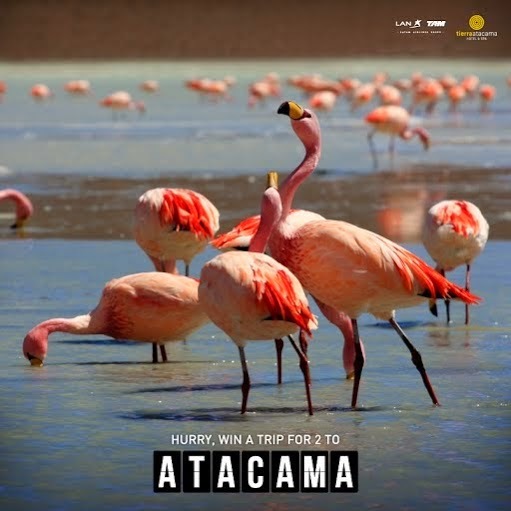 When you enter the Countdown to Atacama sweepstakes you can win a trip for two people to the Atacama Desert in Chile from the US. Can you believe that?! It is a great opportunity to see a beautiful area of the world that most people never experience. Do you have any idea how much that would save? It is basically an entire trip, paid for! Usually a sweepstakes may include hotel or even hotel and airfare but throwing in all the meals and transfers is HUGE! 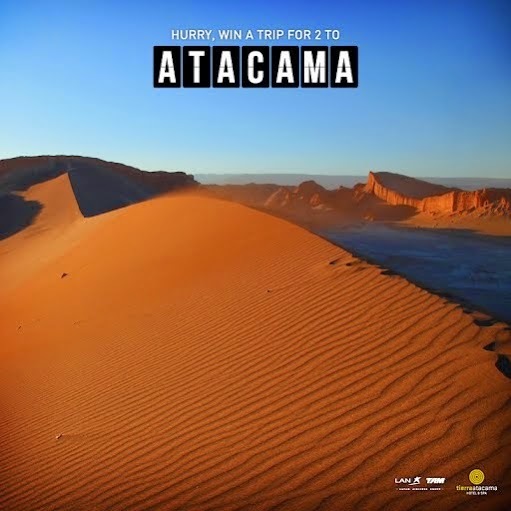 So what exactly is so great about Atacama? The Atacama Desert, located in northern Chile, is the driest place on Earth. It is home to spectacular scenery, and attractions that include the geysers Del tatio, the Valle de la Luna (Valley of the Moon—known for its sunsets), Cejar Lagoon, a sanctuary for Flamingos and so much more. The Atacama Desert is also known for sandboarding. Now that is not exactly my gig of choice but I know a lot of adventurers even in my own family that would just love to give that a try! The town of San Pedro de Atacama is a small, historic village with lots of opportunities to soak in South American culture at its finest. 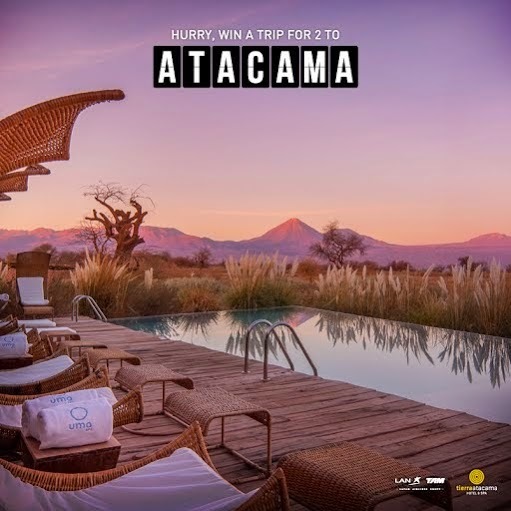 The Tierra Atacama Hotel & Spa, where you will be staying when you win, is modern and luxurious. It offers guests an ideal jumping-off point for exploring the Atacama Desert and even provides guided excursions to many of the desert’s attractions. Now doesn't that sound too good to pass up?? I agree so follow my lead and get entering (link above)! And hurry the sweepstakes ends at 11:59 pm (EST), October 3, 2014.